A devout Christian and Cybersecurity Program Manager with over 15 years’ experience in providing enterprise-wide IT & Cybersecurity solutions to several Federal Civilian Agencies, Defense and Private Industries. He directly engages and supports senior level executives (CIOs, CISOs, COOs, CTOs, etc.) to manage business and IT security risks by planning and implementing strategic cybersecurity solutions that align with the organization’s vision, mission, and goals. Bernard graduated with a B.S in Computer Science and M.S in Information Security & Assurance from George Mason University (GMU), Fairfax VA. He also holds several IT certifications to include a GMU graduate certificate in Computer Networking, Federal Acquisition Certification in Program and Project Management (FAC P/PM Level 3), Certified Information Security Systems Professional (CISSP), Project Management Professional (PMP), etc. 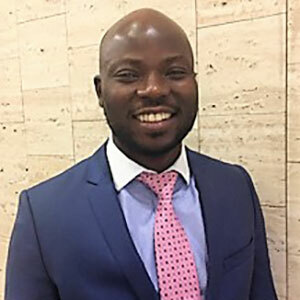 Currently, Bernard serves as an IT Security Program Manager in the HHS Office of Information Security (OIS) where he oversees the development, implementation, and enhancement of IT security programs, policies, procedures, and technical capabilities across the HHS Enterprise. In this role Bernard develops and manages relationships across the HHS Operating Divisions and other Federal and Defense Agencies.